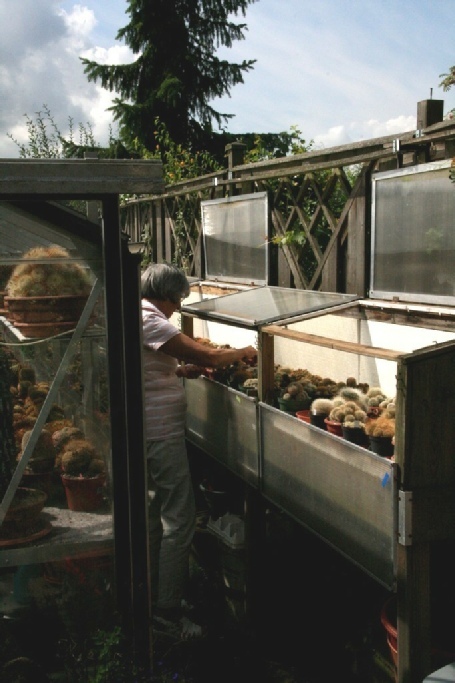 The greenhouse is the perfect place to house a collection of cacti. That is where these plants will find the best conditions of light and heat they need. 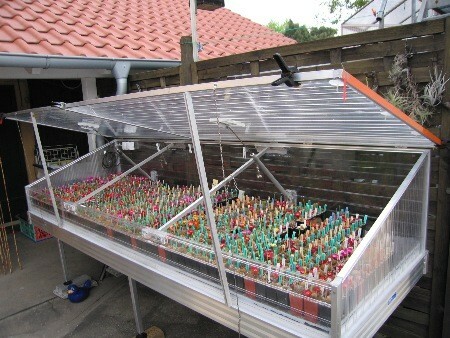 My greenhouse is made of aluminum and glass. Its dimensions are 6m x 3.50m. There are four skylights fitted with automatic opening. It is not installed on a concrete slab. It is simply placed on the ground. Inside, I spread a layer of sand on which I put a duckboard. Despite this very simple installation, I have never encountered any serious problems of moisture and condensation. On the other hand, in winter, mice and field mice tend to go in the greenhouse by digging the ground. 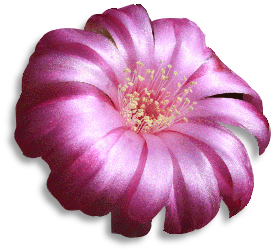 So, in recent years, in winter, I constantly leave some poison to prevent my plants to be meals to these nocturnal visitors. I maintain my greenhouse out of frost. I use for this purpose a electric blowing heater of a power of 3.3 kw. - The thermostat acts only on the heater. This means that the fan is constantly on. Which was not previously the case. 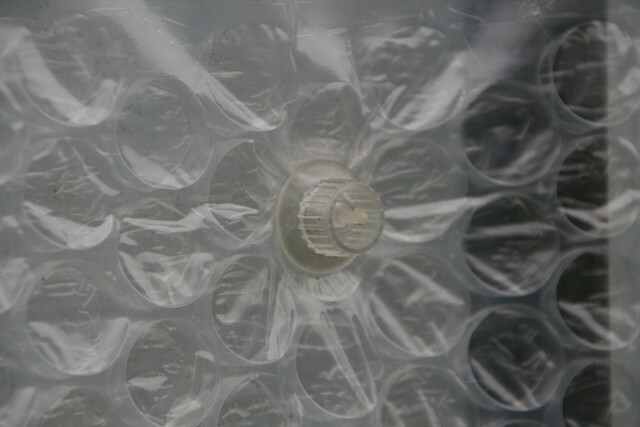 Considering the energy price, I isolate my greenhouse using bubble wrap specially designed for this purpose (coarse bubble plastic, UV resistant - not to be confused with the plastic with small bubbles for packing fragile items). 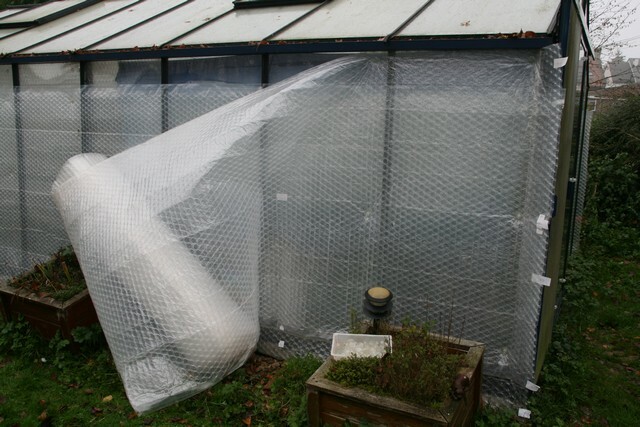 Originally, I had placed the insulation inside the greenhouse. 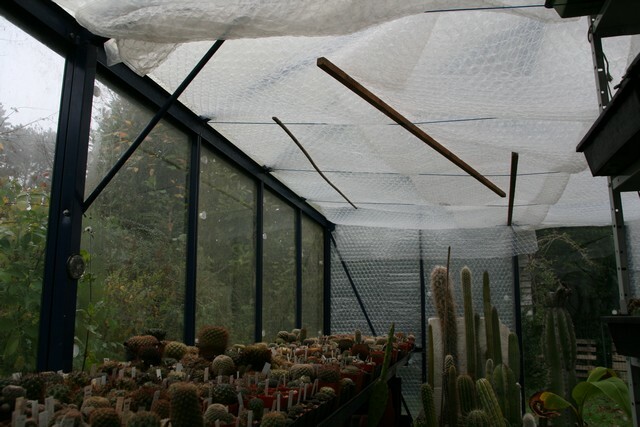 Unfortunately, once the cacti are installed on the shelves, it becomes very difficult to remove the insulation. It has remained in place for several years, until I found a German supplier selling a fixing system suitable for outdoor use. 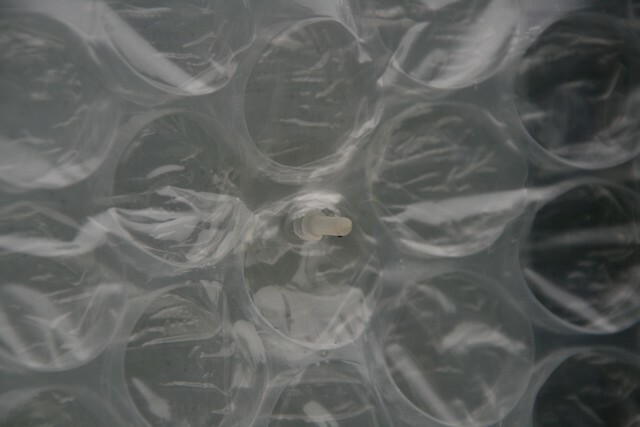 - The other part is screwed onto the first one, fixing the bubble wrap. As can be seen in the photo (right), I have to use two strips of plastic to cover the entire height of the greenhouse. It is 1.70 m while my plastic is only 1.50 m. Which means that I have a double thickness of insulation on most of the height. I use these two strips to cover three sides of the greenhouse. This work is done in just one hour (same for disassembly). On the fourth side, there is a sliding door. I must work differently on this side. The surfaces located on each side of the door are isolated from the inside, the door is isolated from the outside. The tip of each gable is isolated from the inside. 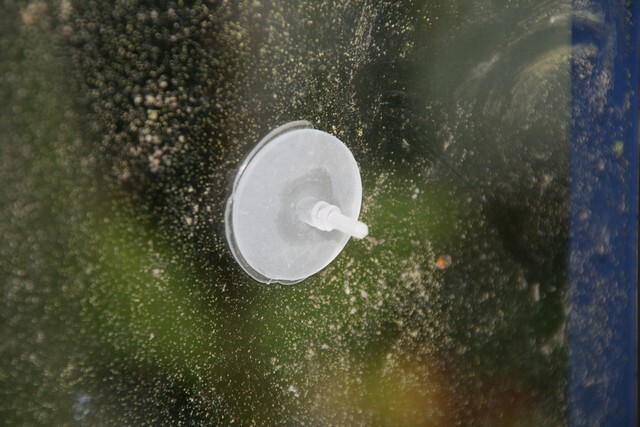 The bubble plastic used inside remains in place throughout the year. Inside the greenhouse, in view to reduce the volume to be heated, I stretched a clothesline up the gutters on which I put a double layer of bubble wrap. When the warm weather is back, the insulation can be removed. On that moment, you have to be extremely careful because the plants being in a shady position throughout the winter months will be permanently burned with the first sunbeam. We must therefore comply with a period of transition: the exposure to the sun will be a little bit longer each day. That’s where I found another use for the plastic bubble clips. I bought some sun screens that I can fix outside the greenhouse using these clips. The shade cloth is simply attached by the upper clips, so it hangs freely. My greenhouse gets the very first sunrays of the day. Early morning rays are not yet hot enough to burn and I therefore place the shade cloth later in the morning. As the days go by, I set up the shade cloth later and later. Finally, a time comes when the cloth is no longer necessary. However you must still be very careful. A period of cloudy weather that would last several weeks will require a new adjustment period. I made the painful experience in this year 2011. We have had here in Belgium a very bad summer. Sky constantly gray with a temperature between 15 and 20 ° C. Then, suddenly, two days with a temperature of 37 ° C. The first day was enough to burn a good amount of my plants! In midsummer, when the sun is high in the sky and enters primarily through the roof, I can also put the shade cloth on the clothes line inside the greenhouse. 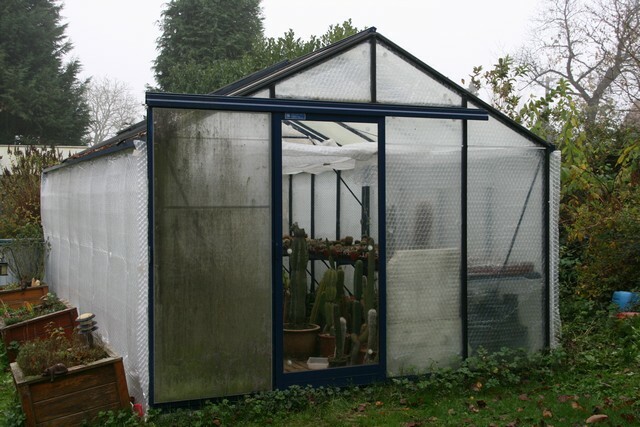 During very hot periods, good ventilation of the greenhouse is absolutely essential. A hot and stagnant air will cause burns even much more quickly. Unfortunately, I think that my greenhouse is missing some of that so important ventilation despite the door and the four skylights. I try to compensate it with fans. 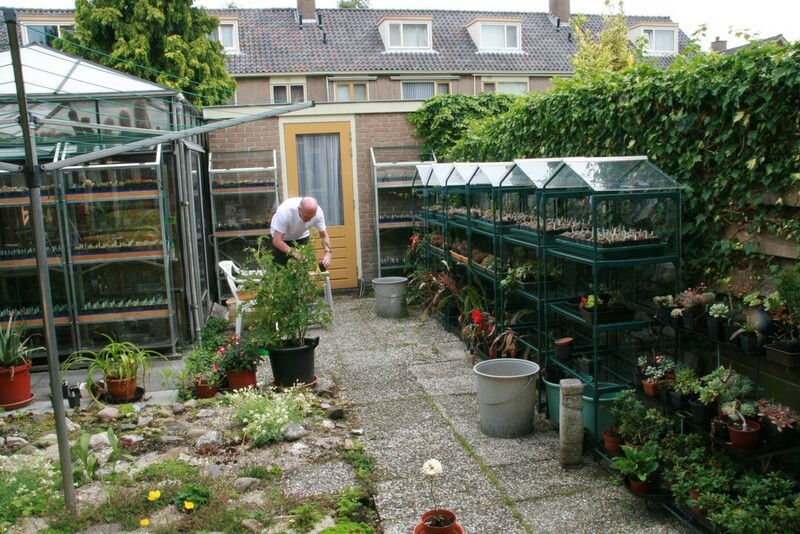 Anyway, consider additional openings if you intend to install a greenhouse. 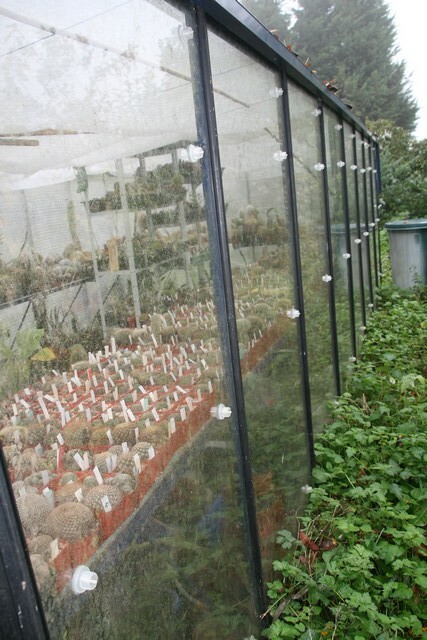 During my visits to other collectors, I have seen other forms of accommodation for cacti. But none of those can be used as winter shelter. The plants are then returned to the main greenhouse that is equipped with a heating system and brought outside when spring is back. On the right you can see shelves topped with a small roof. Frame whose upper parts and facades are removable . On the website of Willi Gertel, we can see a much more sophisticated installation. Besides the aluminum table (like those used in garden shops), everything is homemade. Here are the "trade secrets" revealed by Willi himself. The base of the frame is composed of a 10 cm layer of insulation on which rests a "sheet" of aluminum 1.5mm thick. Above this aluminium foil, there is an empty space of 16 mm wherein is installed an electric heating cable. Above this gap, is placed an aluminum sheet of 3 mm thickness on which are placed the plants. The frame itself is composed of Plexiglas Alltop® multi-skin sheets of 16 mm thickness and aluminium profiles. Plexiglas Alltop® has been chosen for its high UV transmittance (unlike polycarbonate). You'll understand that with this system, it is no longer necessary to move plants. Another big advantage with those kind of horticultural frame systems is that the plants are in the great outdoors! Plants can be accommodated throughout the year, a heating system being integrated.